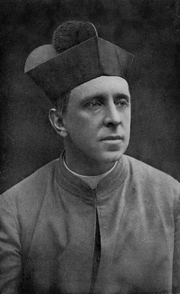 Robert Hugh Benson (18 November 1871 – 19 October 1914) was an English Anglican priest who joined the Roman Catholic Church (1903) in which he was ordained priest in 1904. He was lauded in his own day as one of the leading figures in English literature, having written the notable book Lord of the World. Robert Hugh Benson is currently considered a "single author." If one or more works are by a distinct, homonymous authors, go ahead and split the author. Robert Hugh Benson is composed of 10 names. You can examine and separate out names.